Things started off great, but I wanted to set my jack plane to take a heavy cut and see how just how aggressive I could get before the bench started to move. I’m 6′-1.5″ tall and 240lbs, so if I really get going I’ve moved many a sizable bench over the years. 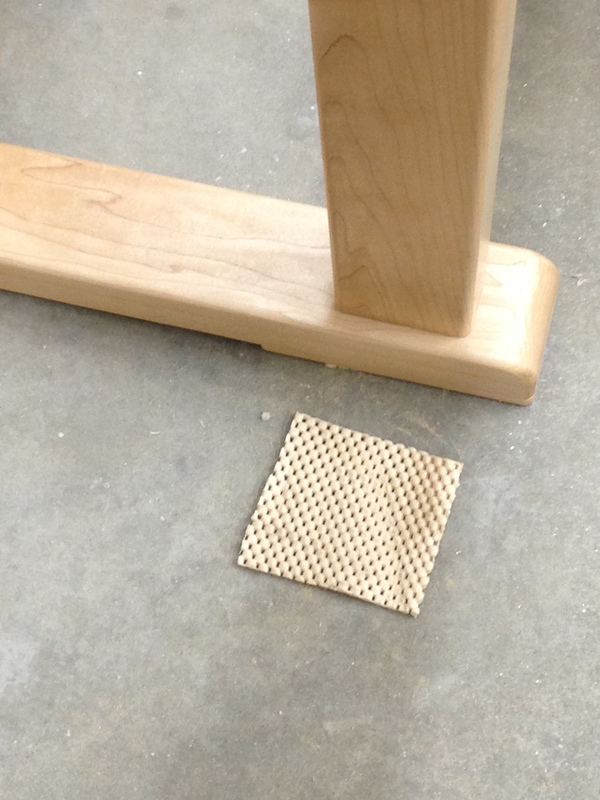 At 7′ long and made of solid maple the bench has a good amount of mass. The problem I have is a very smooth concrete floor which provides little traction for wood. To my surprise it worked great. The weight of the bench compressed the pad so much the bench height is negligibly higher off the ground. I was able to aggressively plane some hard maple scraps left over from the bench and it was solid and stationary. I’m sure someone who really wanted to move it enough could find a way, but the increase in traction was impressive. If you’re also living with a concrete floor in the shop you’ll want to give this a try — it’s about the best $1 bench upgrade you can make. P.S. I’ll make some posts about building the bench, but right now I have a some competing priorities taking my much of my time. We have a baby on the way in August, I need to build a crib, and I’m teaching for much of the rest of the summer. I’ll be posting as I get some free time here and there but it may be in spurts. P.P.S. In digging up the the blog post above from Chris I learned that I am not the first to do this sort of thing with various forms of rubber padding — nonetheless the simplicity and the results were still worth sharing. I did the exact same thing a couple of years ago when I built my bench but my concrete floor had an epoxy coating but it still works great! Ah! such a good idea! Surprised I didn’t think of it sooner, it’s so simple.